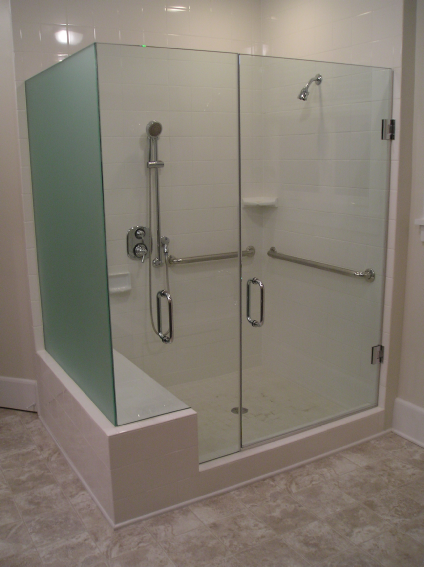 Our area of expertise is the frameless glass shower enclosures and shower doors that we install. We are, by no means, experts at all phases of building construction. We have, however, seen many different methods of constructing showers during the installations of our frameless shower enclosures, combined with our strong knowledge of bathroom construction, design, and remodeling in general. It is solely our opinions based on experiences, knowledge, and beliefs expressed within these blog entries. There are several ways to build a regular tiled shower. The traditional way to build a shower is to use a concrete backer board substrate for the walls and create a mortar base using wood 2x4’s for the curb. Then, cover the base floor and curb with a rubber membrane 6 inches up onto the walls. The process should be finished by using tile, marble, stone, or granite thinset onto the walls, floor, and curb. While this is an acceptable method, a better technique is to use both the concrete backer board and a waterproofing membrane called Shluter®-Kerdi. We have found this method of construction to be the absolute best in terms of waterproofing a shower. The Shluter®-Kerdi shower system comes in a kit. Although, we recommend still using wood 2x4’s for the curb, instead of the Kerdi curb, for the additional strength we need to install our shower enclosures. Under no circumstances should drywall or green board ever be used in a shower wet area. Green board is water resistant so it is acceptable to be used in the non-wet areas of the bathroom, but when green board meets the concrete backer board for the shower area, tile should never be allowed to adhere to the green board. Green board will remove the moisture from the thinset used to adhere the tile, and any water that penetrates the grout lines will also be absorbed by the green board which will eventually lead to water damage, mold, and mildew. Showers built for frameless enclosures require specific detail during their construction. Since frameless shower enclosures have no frame, the top of the curb must be sloped 5 degrees inward toward the shower drain to prevent leakage from any water that sheds off the door while taking a shower. Additionally, we have found that having (2) 2x4’s behind the wall where the door will be hinged, helps anchor the door. We hope this information helps in the construction of your shower or bathroom project. When we are asked to design and install a frameless glass steam shower enclosure, many customers ask whether they need a transom or not. To answer that question, the purpose of a steam shower transom must be understood. The transom has several functions. When left in the open position, the transom removes the humidity from the shower area during a regular shower. It is also left open so mold and mildew will not form from leftover humidity after the shower is used with or without steam. When taking a steam shower, the transom can act as a second thermostat for steam control. Most steam shower controls use temperature or time to regulate the steam. When a temperature controlled steam shower is turned on, the control stops the steam at a set temperature. As the temperature in the steam shower cools, the control senses the temperature drop and releases more steam. This cycle can cause temperature differences in the shower that can be felt by the user. The transom in a steam shower can be opened slightly to release just enough steam so the controller never reaches the cut off temperature. This effectively fools the controller so that it maintains an even temperature with constant steam. If no transom is installed, the only option to perform these functions, is to open the door slightly during the shower and remember to leave it open after taking a shower. So our answer to the question if a transom is needed or not for a proper steam shower is: If you like mold, mildew, temperature differences, and inconvenience, then it's not needed. We have seen improper bathroom construction techniques in all types of projects from basic bathroom remodels, to lavish multi-million dollar new construction! So, in this post, we will identify common bathroom and shower design mistakes, and how to avoid them. One of the most common mistakes we have seen is the location of the bath fan. To understand the proper location of the bath fan, the purpose must first be understood. The bath fan function is not to remove foul odors from the bathroom area. Its intended function is to remove the humidity from the shower area after a shower is taken. Removal of the humidity is important to eliminate the possibility of mold, mildew, and water saturation that causes peeling of the paint within the shower area. The bath fan should be located within 12 inches of the shower area. If a wet area bath fan is used, it can be located within the shower area itself. The bath fan should be used while taking a shower, and left on for 5 minutes immediately after taking a shower. Another common mistake we have seen is with the finished openings of a shower that requires only a single door. A shower requires at least 12 inches of ventilation above the shower door, for the above mentioned bath fan to remove the humidity within the shower area. Since the average shower door height is 72 inches, a minimum finished opening would be 84 inches. During average bathroom construction, the normal ceiling height is 96 inches so ventilation is not a problem. However, when a header is used above the shower door opening to “frame” in a shower door for aesthetics, we have seen this header placed too low thus effectively eliminating all ventilation of humidity from the shower area. Humidity will not rise up to ceiling height, then come down to go underneath the header, without cooling and condensing first. After a shower is taken in a framed shower, the remaining humidity will be trapped and mold, mildew, and water damage will occur. The only solution to this problem, is to install a specially rated wet area bath fan within the shower area to remove the humidity during and after the shower is used, or to not use a header at all. We hope this information helps in the construction of your bathroom project. When deciding to use a patterned glass, standard tempered clear, or low iron content clear (sometimes referred to as starfire clear), there are some things you may want to consider. Budget is a factor to consider since each pattern costs more than traditional standard clear. Patterned glass also has a tendency to reduce light transmittance, causing the shower area to be dark while in use. A special rated light for wet areas, located within the shower area, is highly recommended because of this reason. We strongly recommend Diamon-Fusion® protection when purchasing patterned glass, because it accumulates the lime, calcium, and minerals commonly found in all water much faster than non-patterned glass. Once this accumulation of minerals occurs, etching begins and cannot be removed from the patterned glass. We primarily use standard tempered clear glass in most of our installations. The standard tempered clear can sometimes appear to have a slight green tint. This green tint is normal iron content within the standard glass. We offer starfire clear, low iron content glass for customers that prefer to significantly lower the green tint effect. However, since the green tint is usually unnoticeable, we normally do not recommend it because the additional expense is unjustified unless the tile used to build the shower area is a very light or white color. When a light colored or white tile is used, the green hue from standard clear glass becomes more pronounced and can detract from the overall appearance of the shower area. Recently, we had the distinct pleasure to provide a custom frameless shower enclosure for a very special family. Recently, we were approached by Mr. and Mrs. Thomason for an estimate on a shower enclosure for their new house. Mr. Thomason is serving in the military and he was scheduled to return to Afghanistan soon for another year of duty, so they needed to decide if they could afford it before he left. We also learned the Thomason’s had 4 children, including a son named Shawn with special needs. Shawn has spina bifida and requires the use of a wheelchair. The Thomason’s built their new home with the needs of Shawn in mind to include: wider doors and hallways, a handicap ramp, and a large shower with a bench. As we learned of the shower configuration and the special needs of Shawn, we understood that a custom designed shower enclosure would be required, which would be a considerable expense. We at Truly Frameless® strongly support the men and women of our armed services. We have also been blessed with continued customer support and growth through these tough economic times. So without hesitation, we decided to donate as much of the shower enclosure as possible, because we felt the Thomason’s both deserved and needed to have the strongest enclosure possible for Shawn. Below is a picture of the finished shower enclosure. In addition to our proprietary embedment system providing the strongest enclosure possible, it was built using 1/2” tempered glass for strength, a 36” wide ADA compliant door, and an additional handle set at the proper height for easier ingress and egress. The 1/2” satin etched return panel was used for privacy because there are no doorways into the bathroom area for wheelchair access. We were honored to have been a part of this project. Even with our donation of all labor involved in the project, this enclosure was only possible with the generous donations provided by our suppliers. For donating all the glass manufacturing and fabrication. With special recognition to: Buffy Merricks and Ben Beeler, Vice President. For donating all the hardware. With Special Recognition to: Brad Murphy and Danny Donahue in the Shower Door Department, and Athena Salazar in Online Support. For donating the Diamon-Fusion® glass protection. With special Recognition to: Mike Galeti, Owner. MAY GOD BLESS OUR TROOPS AND BRING THEM HOME SAFELY! We’ve been asked many times; What is the worst shower design for a frameless glass shower enclosure? The absolute worst and most expensive shower design is the neo angle shower. The neo angle shower is the name for a shower built into the corner of a bathroom. A neo angle shower design reduces the total area within the shower by cutting off an entire corner. It is the most expensive frameless shower enclosure to provide, because of all the required manufacturing of the glass and the hinge hardware for the door cost 3 times as much as wall mounted door hardware. It is also the most prone to leakage, because no matter which wall the shower head is on, the shower head is always pointed at a door seal. Unfortunately, some bathrooms are simply just too small to have anything other than a neo angle shower enclosure. At least now its known why that small bathroom project costs so much. We get several requests to have the door centered between two inline “wing” panels. Although we agree that having a centered door configuration is very beautiful, it is not very functional and prone to failure in addition to being expensive. A typical “frameless” glass shower enclosure installer uses a set of pivot hinges located in the header and on the curb for the door. We never use pivot hinges in the designs of our shower enclosures. Pivot hinges are unable to withstand the constant forces enacted upon the door when opening and closing. They typically allow the door to slip within the hinge requiring constant adjustment of the door for proper clearance of the fixed panel. Secondly, when possible, we always try to hinge the door off the “wet” wall (the wall that contains the plumbing for the shower). We do this in order to avoid having to step inside the shower, around a fixed panel, to turn on the shower. By opening the door from the wet wall, it allows the customer to reach underneath the shower head to turn on the shower and not get sprayed by cold water every morning. If the door is centered between two fixed panels, there is no way to avoid having to step into the shower to turn on the water. Please remember, an important tip to remember when building your shower and enclosure is; functionality should always come second to beauty. What good is the most beautiful shower enclosure if it leaks, fails, or forces the user to use it cautiously? The most commonly found mistake see on a consistent basis is improperly sloped curbs. It is the reason behind the myth that all frameless glass shower enclosures leak. The curb is the part of the shower that is a “step up” to get into the shower area. The curb could be considered the most important part of the shower. It is the top of the curb, sometimes referred to as the threshold, that is of most importance. We commonly see the the top of the curb sloped opposite of the drain. The top of the curb should have no more but definitely no less than a 5% positive slop inward towards the shower drain. Much more than that, and it becomes difficult for the shower door to open because the angle crushes the seal. Anything less than 5% slope towards the drain, and it is prone to leakage because water will follow gravity. Our best recommendation is to use a single solid piece of granite, marble or stone instead of tile for the top of the curb. It is easier to get the proper slope towards the shower drain and eliminates the tile grout lines. Since the bottom seal of a frameless shower door rides on top of the curb and cannot follow into the grout lines, a solid threshold provides a better enclosure seal so water cannot leak out through the grout lines. The price of frameless glass shower enclosures is a considerable part of the overall budget for any bathroom project. Yet, it is often the most overlooked. There are shower design options that can significantly reduce the cost of your frameless glass shower enclosure without compromising the look of luxury. Surprisingly, the glass alone is not the most expensive part. Most of the cost for a frameless glass shower enclosure is in the manufacturing of the glass that is required. Each hinge notch, each bench notch, each miter, and each hole that is required because of the shower design, adds significantly to the total cost of the glass within the shower enclosure to be built. In order to reduce the cost of your frameless glass shower enclosure, consider eliminating the shower bench or eliminating a return panel from your bathroom design. The more complex the shower design, the more your frameless shower enclosure will cost. So as the old saying goes, “Keep it simple”.